It's funny how you can read books as far afield as China and Australia and not realise there are talented authors on your own doorstep. I discovered the author Robert Gibson in Morecambe bay, only a few miles from my home. Robert has been writing science fiction stories for a number of years, The Slant was his first novel and is the beginning of The Kroth series. The Slant tells the story of young Duncan Wemyss who finds himself transported to a strange world after witnessing a (succesful) telekinesis experiment. The world of the Slant is a planet that has a real "up" and "down", the lower latitudes tilting ever more sharply towards a drop into space. The northern territories around the North Pole are the only level spaces and are fiercly defended against the vicious creatures of the lower latitudes. When such creatures decide to wage war, Duncan is forced to call upon talents he didn't know he had to defend his new home. Having a world with an absolute gravity, where people can actually fall off if they reach the equator - is an interesting, original idea. It's also one that is explored well through the eyes of the young protagonist. While this may seem a little far-fetched the explanation for such a world are well thought out and with a good degree of conviction. Pacing is swift, the plot moves forward consistently with little wasted space and a good balance between story and world-building. The quality of the writing is excellent with clean, crisp prose that should suit most age groups. In tone the story reminds me of mid-twentieth century fiction, early Asimov or Clarke fiction that evokes that sense of wonder in the universe. 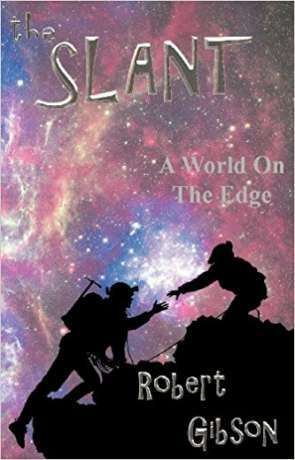 The Slant is engaging, accessible and enjoyable fiction with some great ideas, highly recommended. Written on 4th September 2017 by Ant.